Sahara Reporters has acquired a video of a confrontation on Saturday, October 27, between the Nigerian military and a parade of the Islamic Movement of Nigeria (IMN), a Shia political movement. The video clearly shows young men, presumably Shia, throwing stones at the Nigerian military, who then responded with live fire. Traffic was stopped as apparent civilians fled for cover and some continued to throw stones at troops. Much about the incident remains unclear; a recent report put those killed at more than ten, though previous reports have suggested three or five. 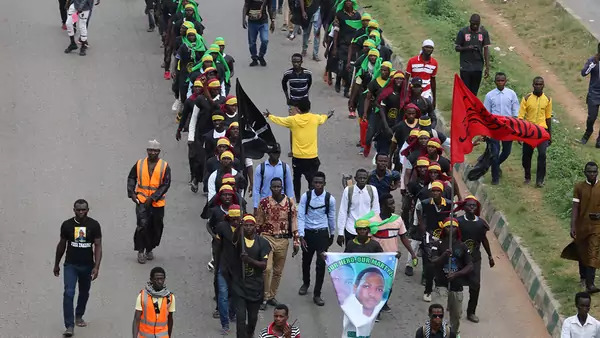 According to Sahara Reporters, on October 27 the Shia were marching from Suleja to Abuja in preparation for a religious event called Arbaeen Symbolic Trek. The marchers apparently took a route that had not been approved by the security services. When the soldiers and police intervened, marchers responded by throwing rocks. The army and police responded with live ammunition. In a press release, the military claimed, among other things, that troops “escorting ammunitions and missiles from Abuja to Army Central Ammunition Depot in Kaduna State were attacked by some members of the Islamic Movement in Nigeria.” The military spokesman, Major General James Myam, also alleged that members of the IMN procession “attempted to overrun the escorts to cart away the ammunition and missiles the troops were escorting,” and that the marchers “established an illegal roadblock denying motorists free passage.” A spokesman for the IMN rejected the military’s description of events, claiming instead that the IMN protesters were peaceful and were attacked. The IMN’s three-day march began on October 28 in Abuja and included a call for the freeing of Shia leader Ibrahim el-Zakzaky, who has been under house arrest since 2015. Members of the IMN, marching in connection with the religious event, support of el-Zakzaky's release, or both, were reportedly fired on by the army on Monday, and clashes continued on Tuesday. Reports place the number of marchers and protesters in the hundreds, despite IMN claims that one million would attend. Overall, the IMN claims some three million followers in Nigeria, though the country's predominately Sunni Islamic establishment says that the real figure is much less. In 2015, there was a bloody confrontation between an IMN march and the convoy of Tukur Buratai, the army chief of staff. In that confrontation, the army killed several hundred Shia IMN marchers. The military states that the IMN had tried to assassinate Buratai in the alleged attack on the convoy. El-Zakzaky has been under house arrest ever since. Objective observers have not found the official explanation credible. The 2015 event is reminiscent of the 2009 confrontation between the security services and the followers of Boko Haram, then led by Mohammed Yusuf. A difference is that thus far, the IMN has eschewed violence. The video of the October 27 confrontation, as well as the subsequent reports of action by the security services, is chilling because it clearly shows how poorly trained the security service personnel were, and how willing they were to resort to the use of live ammunition in the midst of marchers and otherwise innocent bystanders. The military explanation, should it be firmly disproven, would become yet another intentionally false claim made by the military to cover up their treatment of civilians.